Yoga originated in ancient India and includes a wide variety of schools and practices. The goals of these schools and practices vary, as well. 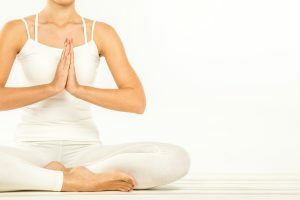 With the recent rise in interest in yoga in the Western world, more goals and benefits of yoga are being discovered including health benefits and rehabilitation benefits. Recently, it was discovered that some yoga poses even help orthopedic issues including frozen shoulder. Adhesive capsulitis, or “frozen shoulder,” is characterized by pain and stiffness in the shoulder. It affects about 2 percent of the population; most commonly it is found in women and people ages 40 to 60. Frozen shoulder may be caused by a health problem that causes general immobilization. The shoulder may also freeze as a way to protect itself and prevent further injury after a trauma. There are three phases of frozen shoulder: freezing, frozen, and thawing. Freezing – Typically lasting for six weeks to nine months, this phase is characterized by a gradual onset of pain in the shoulder. As the pain becomes more intense, the shoulder loses its full range of motion. Frozen – This phase occurs in the four to six months after the freezing. Your pain will decrease, but your range of motion will still be limited. Daily activities become difficult. Thawing – As the shoulder slowly regains its range of motion, it is in the thawing stage. It takes somewhere between six months and two years for the shoulder to regain its normal– or close to normal– strength and range of motion. Yoga is an exercise practice that combines breath control, simple meditation, and poses to help relax and strengthen the mind and body. When practicing yoga, always listen to your body and breath. If you push yourself to a point where you lose concentration and stop breathing, you are being too aggressive to your injury. Below is a yoga routine utilizing five simple poses that can help your frozen shoulder recover and reach the thawing phase. 1. Start on your hands and knees with your back straight. Take a deep breath in and lift one arm straight in front, keeping your back from curving or caving. Exhale and return to your hands and knees. Repeat on the other side. 2. From your hand and knees, tuck your toes in and raise you hips to downward facing dog. Take a few large breaths, in and out, in this position. 3. Release your knees and come down on your stomach. Gently and slowly, reach your hands to your ankles or toes for bow pose. Take a few large breaths, in and out, in this position. 4. Slowly lower your arms and legs back to the ground then rise to sitting on your knees with your hands in a prayer position and take a few breaths. Breathe in as you place one foot in front of your body and turn into half-prayer twist pose. Exhale to release tension in that shoulder. Return to knees and prayer pose then repeat on the other side. 5. With both sides stretched, return to knees on ground. Breathe in and raise arms overhead. Exhale slowly as you circle your arms down and around and place your hands behind you in reverse prayer position. Take a few big breaths, in and out, in this position. Once done, you can move to child’s pose to finish the practice. Frozen shoulder is a serious orthopedic issue. However, this yoga flow will help with recovery and thawing your frozen shoulder. Speak to your doctor today about how you can incorporate yoga into your rehabilitation routine. If your frozen shoulder symptoms persist, contact Dr. Stacie Grossfeld. With over 10 years of experience as an orthopedic surgeon, Dr. Grossfeld has extensive knowledge surrounding shoulder injuries and rehabilitation. If you are in the Louisville or Kentuckiana area and are suffering from frozen shoulder, contact Orthopaedic Specialists today at 502-212-2663.